jogging along with me – welcome! 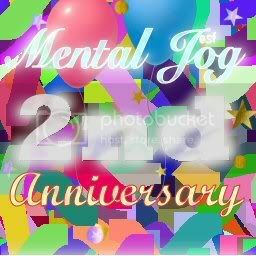 wish mental jog a happy anniversary, will ya. thanks. 102573 visitors (see left, bravenet counter). 1st anniversary post part I and part II. honestly speaking, the reason i started blogging was that i wanted an avenue where i can speak freely what's on my mind regarding the country's policies, the gomen and on certain current issues that was brought up. then i found out that once in a while, i don't mind personal posts too. they will kind of break the monotony of all the grumblings directed at the gomen…hehe… or rather, they will make people realise there is a very human side behind me, despite all the rantings at social and political issues.lol. anyway, of course i still prefer socio-political posts than personal posts. another reason i started blogging is of course because i love writing. started since i was in school and always scored high marks for essay writing! as young as 12 years old i already contemplated being an author! haha. but it never materialised. throughout the years, i had been doing some writing here and there though to paper and magazines. once, i was offered a job as a junior journalist by the late s.h. tan (former editor of the malay mail) when he was managing the defunct 'malaysian post' (earlier known as 'new thrill') but i had to turn it down because i can't afford to leave my beloved penang. if i accepted it, i would have become a journalist of the sun by now! (because the sun brought over malaysian post). ok on this 2nd anniversary of getting into the blogosphere, i would like to take the opportunity to thank all my readers, especially the regulars ones like wits0, justme, ali alahallah ditta… and now ah pek… hopefully you would be regular, eh, ah pek, me old (as oppose to new lah, not to young) friend?. yes, thank you to these 3 and EVERYONE ELSE for visiting my blog and for taking time to make comments. you guys makes me wanna blog on and on and on…. let's hope i will still be around to celebrate the decade anniversary.